Forget about Disney’s little mermaid (or even Hans Christian Andersen’s). 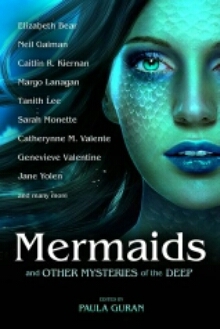 Don’t let the cover fool you; while the occasional fish-tailed beauty makes an appearance, the mermaids and other sea creatures in Mermaids and Other Mysteries of the Deep, edited by Paula Guran, are just as likely to be genetically engineered navy officers or full-on monsters. And the writers take full advantage of the range of folkloric subjects available. Ships’ figureheads, male mermaids, selkies, and more appear among this anthology’s pages. These deep-sea myths come to life both prey on humans and fall victim to them. This brilliant anthology makes use of the mermaid and associated myths to tell rich, socially aware stories that question both the power and mystery of the mythical other AND the monstrosity that can live within the human heart. Furthermore, the ocean itself is also often as much a feature of the stories as those who dwell within it. This anthology’s is as much as a love story for or ode to the sea as it is an investigation into the mermaid myth. If that isn’t enough to make you dip your toes, this fresh, nuanced collection also boasts some big names in the speculative fiction scene, including Neil Gaiman and Elizabeth Bear. The range and depths of these stories coupled with the impressive talent assembled to tell them make Mermaids and Other Mysteries of the Deep one of my most enthusiastic anthology recommendations.